Some of you may remember that I had a bit of a mishap in my etrog preservation last year. Being relatively new to the world of sugared preserves, I mis-judged my marmalade, and wound up with four jars of etrog-ginger fruit sauce instead of jam. This year I did some research in advance, trying to come up with a better plan. Last year's recipe included a packet of commercial pectin, and even so, it failed to jell. Intriguingly, the only other recipe I found which mentioned pectin was this orange marmalade recipe. All of the others I located depend on the natural pectins in lemon juice, which seemed dubious to me, given that last year's recipe failed so utterly. The most basic recipe I found is this one for etrog jam. I also found a tasty-sounding three fruit marmalade, which I imagine would work with an etrog in place of (or in addition to) the lemon. But most interesting to me was spicy blueberry-citrus marmalade, which sounded easily adaptible to include an etrog. So that's what I tried this year -- I replaced the lime in the recipe with my etrog, and in lieu of crushed red pepper I used the ground Ghanaian red pepper that's a staple in our household cuisine. The recipe says to "boil, uncovered and stirring often, 15 minutes or until a gel forms," but after half an hour of uncovered boiling, there was no sign of jelling. Not wanting fruit sauce again (we still haven't eaten last year's! ), I added a packet of Ball fruit-jell liquid pectin for good measure. Once I did that, and simmered and stirred it a bit longer, I tested some on a cold metal spoon, and it was perceptibly thicker. (Also, absurdly delicious: tangy, spicy, citrusy.) 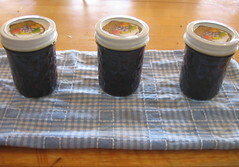 I wound up with three jelly jars' worth -- a smaller yield than expected, maybe because I simmered it for so long. It's really yummy; it may take work to save one of these jars until Tu BiShvat. But I'm determined to link the two festivals together in that way...and who knows? Maybe next Tu BiShvat, I'll feel inspired to eat some of last year's etrog-ginger fruit sauce, too. Technorati tags: religion, Judaism, etrog.